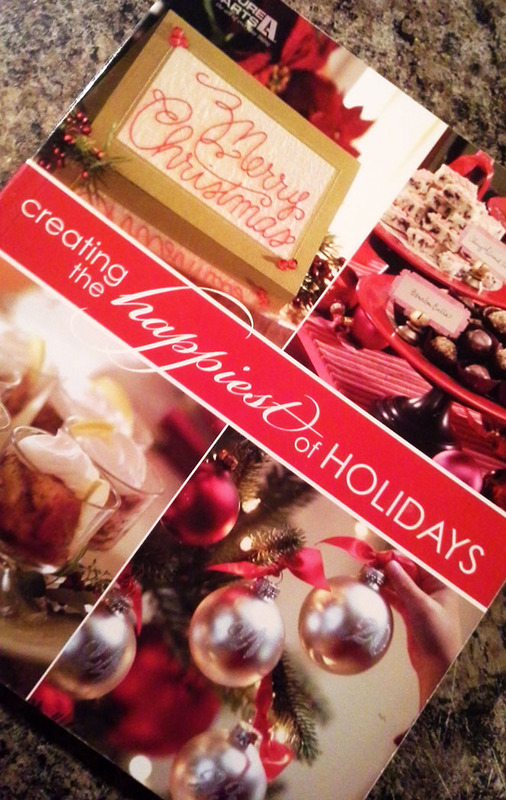 My Holiday Kitchen | Creating menus and sharing recipes for the holidays and more. Spring is finally here and it’s time to start thinking salads. Be it a new take on a vegetable salad or the melding of fruit and veggie into a refreshing plateful of healthiness, I really like mixing up the flavor combinations in a salad. Now that’s it warming up outside I’m craving fresh and light salads. I’m sharing a few new ones that I’m adding to my rotation. I have a couple that look like they could do double-time as either a robust side dish or a light but filling entree. I’ve also been looking at a fresh take on broccoli salad and a new way with melon. Let’s start with this refreshing looking fruit salad. I’ve been seeing this Mojito Fruit Salad all over Pinterest lately. 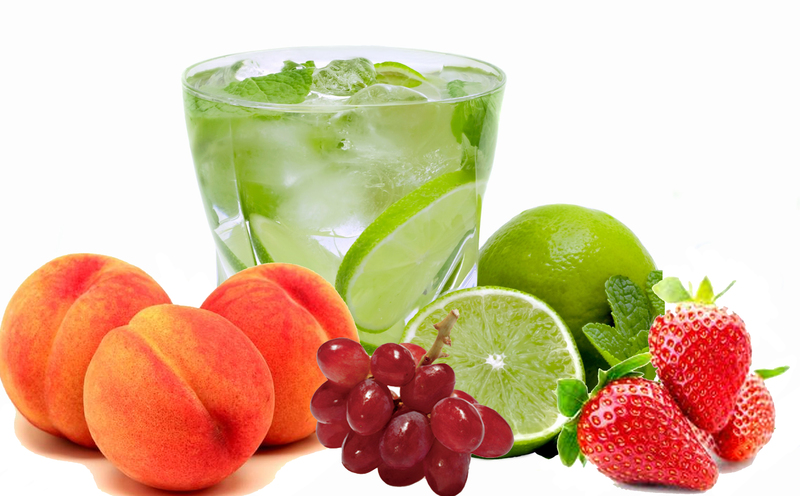 I love fruit salads and I think the addition of lime simple syrup and mint will give it that extra little kick. Of course you can add rum too for a little more of an adult flavor experience. I could see this one making it’s way into the 4th of July menu. With the peaches and nectarines it would be perfect during the hot summer months. Another fresh take on a traditional salad is this Broccoli Grape Salad with Creamy Lemon Dressing. I’m sure we’ve all had multiple versions of broccoli salad but I haven’t had one with lemon dressing before. I like the addition of grape and cucumber to this salad and I do think the lemon dressing will give it a nice tangy flavor. This would be good to make at the beginning of the weekend to complement both a sandwich at lunch and a grilled chicken breast or steak at dinner. Another use for the mint from the Mojito Salad would be in this Shaved Melon Salad. It looks simple enough as it’s just thin strips of honeydew and cantaloupe melons. These are dressed with an olive oil, sherry, honey, lemon mixture. I think the flavor combination could be interesting so I plan on trying it when the melons are in season. I have also been looking at a couple of heartier salads that are still light. The first is an Orzo Salad with Chickpeas and Cucumbers. I like chick peas in salads; they have a slightly nutty flavor and chewy texture that makes the salad filling but still healthy. The orzo would add to that heartiness factor, but in a light way. The cucumbers and feta cheese round it out nicely to make it a great option for a light but hearty warm weather main dish. This final salad is one that I’m going to try sooner rather than later. I’ve only recently started using Farro and I think this Farro, Cherry, and Walnut Salad is great way to showcase this tasty grain. The cherries would give it a nice pop of flavor with the walnuts and celery giving it a nice crunchy texture. Now that it’s getting warmer out I’m ready to start lightening up the menu. Do you change up your menu with the seasons or add some in-season produce to your recipes? Until next time! We’re coming up on my husband’s birthday and this year he’s requested a seafood themed dinner. Seems easy enough, but there are a lot of recipes to choose from. I would also like to try a few different things for him. We eat Salmon weekly, so that one’s out. Beyond that I have an ocean to choose from. Let’s get started. One recipe that I haven’t tried yet, but want to make, is crab cakes. My trusty “Back to Basics” cookbook has a crab cake recipe and it looks delicious. The only thing that’s a little off putting is the lengthy list of ingredients. Knowing that I’ll be making a few different items makes me a little leery of anything that could be too time consuming. I’ll keep it on the list for now. Shrimp is usually a winner and I have just the recipe for it. 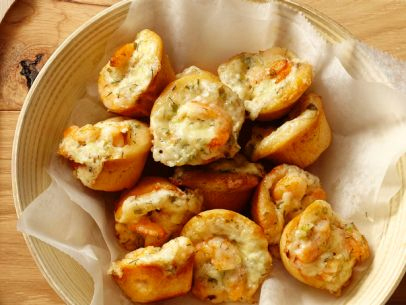 I made these Shrimp Puffs a while back and they were a huge hit! They only require a few ingredients and they’re easy to make. Plus, they make a lot. You could easily fill up just on these puffs. I’m thinking these are a definite yes. 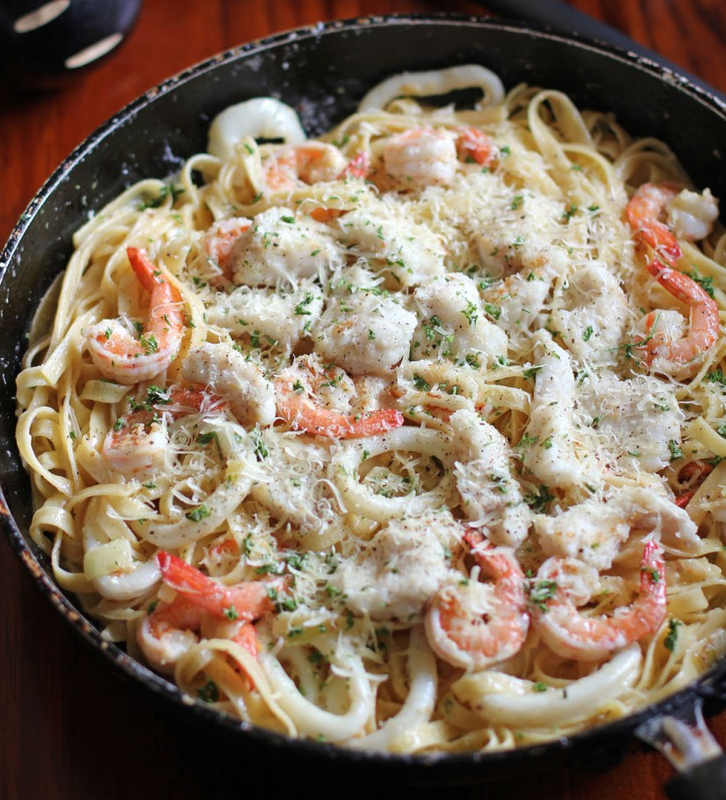 Another option that I’m considering is a Seafood Alfredo with Homemade Pasta. I’ve made pasta before so I know it’s pretty easy and I can make it in advance and freeze it so I’m not too overwhelmed on the day of the dinner. This also allows me to mix up the seafood offerings. I could have shrimp, scallops, calamari, or whatever else sounds good. Plus, who doesn’t love a good Alfredo? While we’re considering pasta dishes I should also think about a Homemade Pasta with Clam Sauce. I’ve made this a few times, once for my mother-in-law’s birthday, and it’s excellent. I’ve used the canned clams, I know fresh is better, but the taste is still great without the big price tag. Oh, the decisions. These are just a few of the recipes I’m choosing from. I always like to make birthday dinners special and the menu planning is a big part of it. So far, I’m planning on making around three main courses along with salad and side dish. We’ll see what I end up with, but I know it’s going to be delicious! Cake and ice cream are the traditional birthday dessert. Except when it comes to my husband. I’ve made blueberry pie for his birthday before since he is a huge blueberry lover. This year he has requested an ice cream cake that contains blueberries, chocolate, and nuts. So, I’ve been scanning through Pinterest looking for something to really wow him. I’m a fan of the homemade meals, so here’s what I’ve come up with so far. 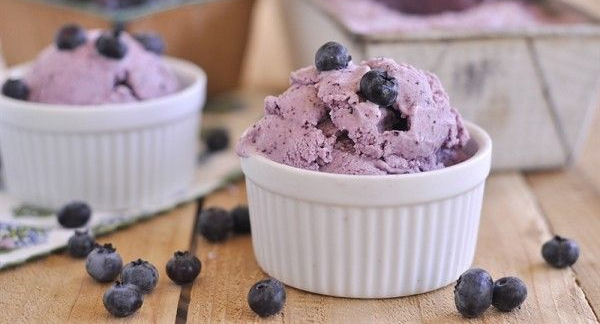 First up is a blueberry ice cream. We’re missing the chocolate and cake with this one. I’m putting it in the list though because finding blueberry ice cream in March is not easy. I’m thinking I could make the blueberry ice cream and then layer it with homemade chocolate cake and frozen blueberries. I’ve never really made ice cream before, so maybe I should keep looking. 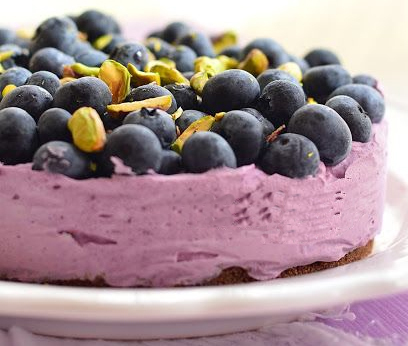 Next up is a blueberry ice cream cake. This one definitely has the ice cream covered. It’s lacking in chocolate though, and cake for that matter. I could improvise it to add both of the missing items. I really like the look of this but I don’t think it’s going to fit the bill. On to the next one. It looks like we’re getting closer. 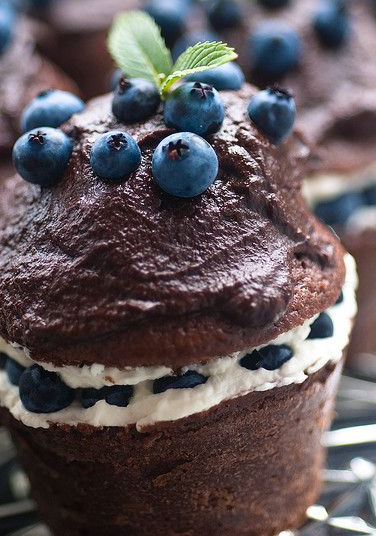 This is a chocolate cupcake filled with a blueberry cream. Then it’s topped with chocolate ganache, although it looks a little thick for a ganache, and fresh blueberries. I have an excellent homemade chocolate cake recipe, so the cupcake piece is covered. It’s missing the ice cream part, so I’d need to improvise with the blueberry cream filling. Potentially I could use vanilla ice cream and add blueberries to it. We’ll see. Hold on, I think we have a winner here! 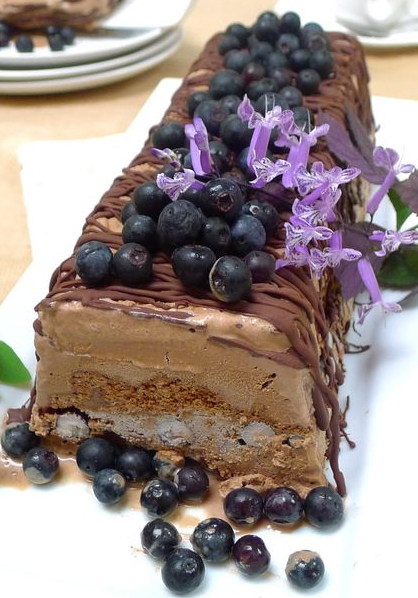 A chocolate blueberry ice cream cake. It has the main flavors he would like – blueberry, chocolate, and cake. I can add nuts to this too. Plus, it looks pretty easy to make. Mainly it’s layering ice cream, blueberries, and crumbled chocolate cookies. Instead of the cookies I will make a chocolate cake, cut it into cubes, and layer it. Regardless, this looks perfect. Well, it looks like I’ve got the blueberry dessert covered for my blueberry lover of a husband. I can’t complain, they are a super fruit so it’s a healthy dessert. That’s what I’m telling myself anyway. I think we’ve all seen at least one or two of the blogs that feature Pinterest fails. Indiscernible frosting jobs and exploding cake cups seem to be the norm. Well, instead of talking about those areas I’d like to tell you about some of the Pinterest wins I’ve experienced. I have tried quite a few recipes from Pinterest. For the most part I’d say the majority turned out. Now, that doesn’t mean I’d suggest all of them. Some were just so-so, while some were awesome. Below are the ones that I will definitely be making again. Let’s start off with a drink win. 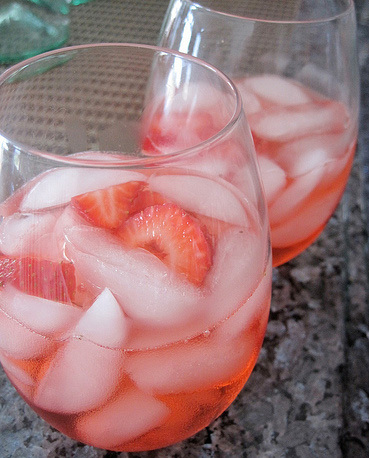 I made this Strawberry Sangria last Spring when we had both sets of parents over for a Sunday dinner. Let me just say wow! I couldn’t find the strawberry schnapps that was called for so I used watermelon schnapps instead. I’d suggest this if you’re looking for something to jazz up your usual drink offerings. Just be careful, it’s so good you’ll want more than just one glass. This next recipe was a surprising win. I made this Taco Pasta Bake for dinner one night not expecting too much. I was wrong. It had such a great flavor. Even my husband, who can be a tough one to impress, commented on how good it was. It was really easy to make too. If you’re looking for something quick, easy, and delicious for dinner then you should try this. This chicken recipe is probably one of the best recipes I’ve made. Ever. Kaytucky Chicken is a chicken breast, filled with a cream cheese, bacon, spring onion, and herb mixture. Then it’s wrapped in puff pastry dough and baked in the oven. If you’re looking for that recipe to impress, then look no further. It takes a little time to get everything put together, but it’s well worth it. My step-daughter is still asking when we can have this again. That’s a sure sign of a winner! One of my more recent recipe wins was Baked Pumpkin Spice Donut Holes. I’ve made these twice and both times they were gone within a couple of hours. I think some people are a bit hesitant to make donuts. I’m here to say, “It’s time to make the donuts!”. Donuts, especially the baked ones, are as easy as making muffins. I have a mini donut baking pan so that’s what I use to make these. Try them, you’ll love them! 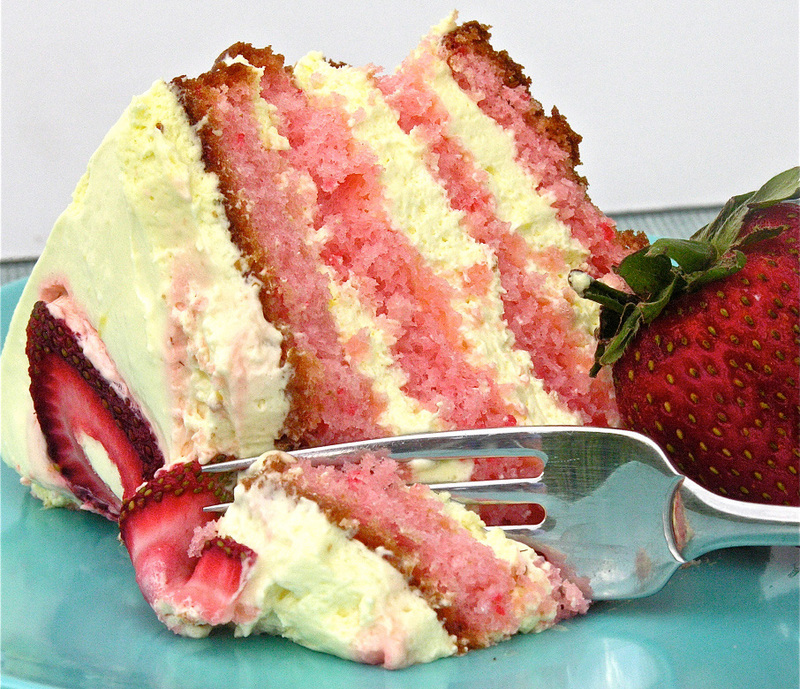 Finally, we’ll wrap it up with a dessert that was a big win, Strawberry Lemonade Layer Cake. It tastes exactly like you hope it tastes; it has the sweet tang of lemonade in the frosting combined with the strawberry cake and sliced strawberries on top, yum! I made this over the summer. It’s a perfect Spring/Summer dessert. I highly recommend it. There you have it. A selection of some Pinterest recipes that were wins. I have others that I’ll share later, but these were some of the best ones to date. What about you? Have you tried a Pinterest recipe that was all you had hoped it would be? Let’s hear about it! It’s getting close to the weekend and we are plan-free for this one. That means I can spend some time in the kitchen trying out some new recipes along with some tried and true favorites. I’m thinking of a full meal menu plus some sweet treats to tide us over. My best bet is a nice Saturday dinner, so that’s what I’ll plan for. First up on my to-make list is a Butternut Squash Soup recipe from Ina Garten. It’s in her Back to Basics cookbook. I’ve made it numerous times, it’s super simple, and always a winner. The most time consuming part for me is peeling the squash. I am not a fan of curry so I omit it, but I don’t feel like the soup is lacking in flavor without it. My plan with the soup is to let it be a starter for our Saturday dinner and the leftovers can be had for lunch on Sunday. Next up, I am going to make a Chocolate Crescent Roll. I’ve seen different versions of this all over Pinterest. I’m going to use the canned crescent roll dough and dark chocolate bars for mine. I may even add some peanut butter to a couple, just because. Quick and easy! I also plan on making a dessert, or two. There are so many options to pick from and I’m on the fence about a few. Do I want cake or cookies? New recipe or tried and true recipe? I’ve been trying a lot of new ones lately which I think is good. I have quite a few cookies and bars that are still untested in my Fine Cooking Cookies magazine as well as some sweet treats in my Barefoot Contessa cookbooks. 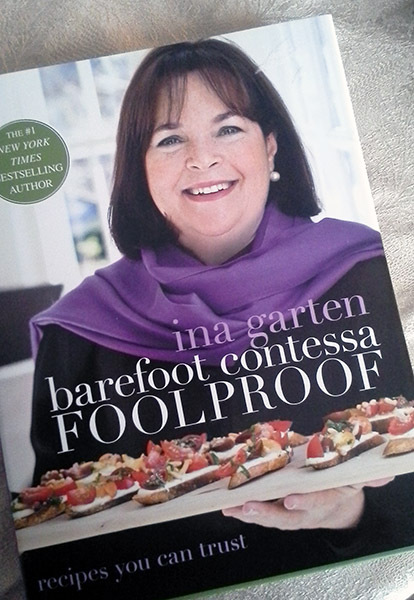 I have yet to make her Outrageous Brownie recipe, which is the one that she sold in the Barefoot Contessa store. I am a huge fan of brownies, so I’m thinking this one is at the top of the list. I should probably make those Friday night as the recipe makes a lot. I’ll leave my last choice as a TBD. I like to leave a little leeway in my baking plans for the weekend. I never know when the mood will strike to make donuts or something, like it did last weekend. They were excellent by the way. 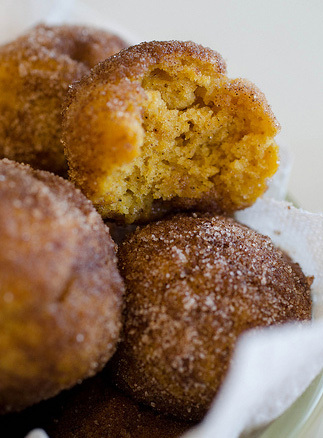 Pumpkin donut holes rolled in a cinnamon sugar mix are easy and delicious. Don’t miss out if you have a chance to make them. Alright, what are your baking plans for this weekend? Is anyone trying something new or even just looking forward to some baking time? Let’s hear it. It’s February 14th and that means it’s time for some sweet treats! Actually it’s always time for sweet treats, but today we’ll focus on the pink ones. I have a few ideas for a little special treat for tonight. Let’s jump right in. 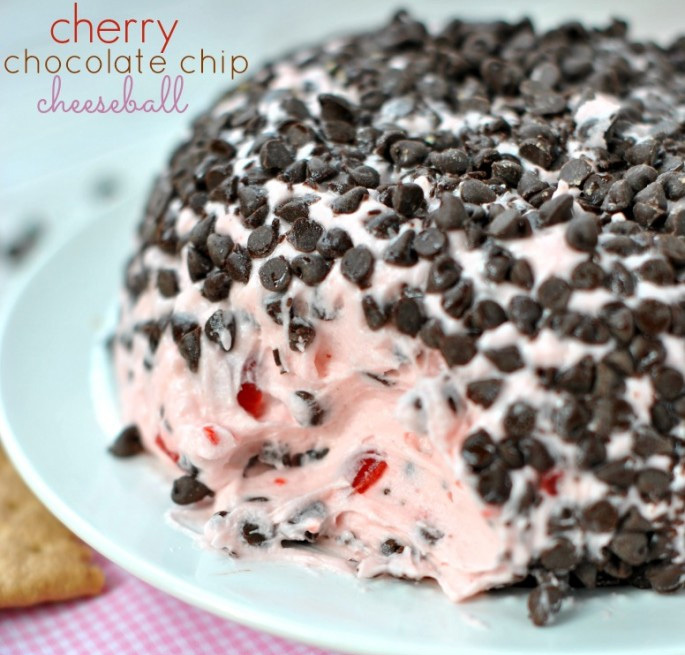 First up the Cherry Chocolate Chip Cheeseball. I made this one last weekend so I know it’s a winner. It’s super easy too. I do want to call out that mine did not set up like the picture. I mixed it as directed and let it set overnight in the fridge, but it was still very soft the next day. I ended up sprinkling the mini chocolate chips on the top of the mix rather than trying to shape it into a ball. Regardless it is delicious. I served it with graham crackers, but I think vanilla wafers or chocolate graham crackers would also be good choices. It’s sweetly addictive; consider yourself warned. Next up are Cherry Krispie Treats with Dark Chocolate. These look so good. 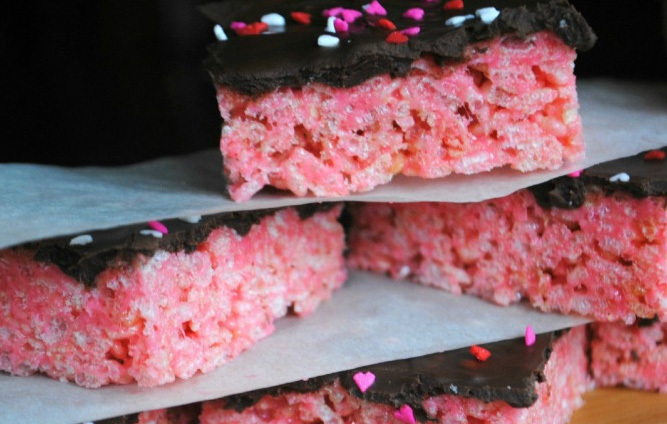 They’re a traditional Krispie treat with cherry gelatin added for flavor and color. Plus, they have a dark chocolate coating. I am a fan of the improvised Krispie treat so I think this would be another quick and easy sweet treat to have as a go-to item. As a third option let’s consider Strawberry Chocolate Chip cupcakes. I wish I had a picture to share with you, so maybe these are what I’ll make so I can have a photo. Regardless, these would be pretty simple to make. I’ve had the cake variation for my birthday many times. You’ll need a strawberry cake mix (boxed or homemade, it’s up to you), mini chocolate chips, and chocolate frosting. I suggest going with my homemade chocolate frosting that I shared here. You can make it as thick as you want based on how much cocoa you add. The big thing to remember here is to go with the mini chocolate chips. They won’t sink to the bottom of your cupcake as easily as the regular size chips. The regular size seems to sink regardless of whether you add a little flour to them first. So, hopefully after this you’re feeling inspired to whip up a little sweet treat today. Regardless if it’s just for you or you’re sharing with others, a sweet treat is always needed. Today I’m sharing some easy, tasty recipes that you can use to create a gift basket to be proud of. I made my first snack gift basket during a recent DIY Christmas stint. I had wanted to do something different from the standard gift certificates that my in-laws typically requested. They normally do a lot of entertaining during the Christmas/New Year week so I thought that a snack gift basket would be a gift they could use. I had quite a few recipes from one of my stand-by Christmas books. I had looked through this one multiple times but had never actually made any of the recipes in it. I liked the idea of giving edible gift items but I thought of them as more of an inspiration for a DIY Christmas. Well, the DIY Christmas was underway so it was time to try this idea out. I started by deciding on which recipes made sense to make. There were a couple that had different flavored pretzels, so I whittled it down to one pretzel recipe. I went with the chocolate covered pretzels as I had other savory options to choose from. Plus, I knew these were easy and tasty so win-win. I had made a cinnamon bun popcorn that I knew I wanted to include. 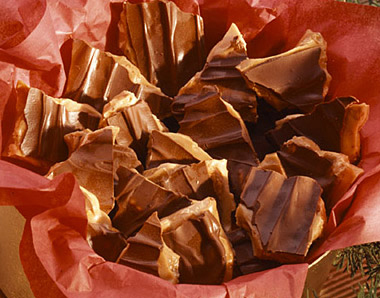 I had also made toffee, which I always do during the holidays, so that was included. I use the Land O’ Lakes chocolate-covered toffee recipe every year. It’s a keeper! The last three items were new recipes for me and they all turned out excellent! I went with ranch flavored oyster crackers, spiced nuts, and homemade mocha liqueur. In regards to the spiced nuts, the recipe recommends pecans or assorted nuts. I had two bags of assorted nuts that I had used for another recipe so I went with those. I think that really ramped up the “gourmet” factor for this gift. So if you’re giving this away I’d say go with the assorted nuts. I used Ziploc sandwich bags to keep the snacks fresh. Then I put one bag of each snack into these cute Chinese food style boxes. They had different holiday looks printed on them and they came in a couple of different sizes. I got them at Michaels for a great price right at the beginning of the holiday season. I printed out the names of each snack and put them on top of the boxes. I put the liquor into a clean wine bottle with a twist top. Then I used a metallic holiday wrapping paper to wrap around the bottle’s label. I printed out a label for the liquor and attached it to the wrapping paper. Once I was done with all of that I placed all of the boxes into a holiday basket. Let me just say this gift was a hit! My mother-in-law commented on it at least three different times in the days following Christmas. She also brought it up during this year’s holiday season and said how much she had liked receiving that gift. This is a great gift during any time of the year. Plus, you can change out the recipes to add in some seasonal flavors. The choices are endless. Let’s recap the final gift basket recipes. Chocolate Covered Pretzels – You just dip the pretzels in melted chocolate. Add sprinkles, drizzle another chocolate over them, be creative.